A half mile away, I sat chatting easily with a friend in a café. There was no smell of smoke, no sound of a crash, not even any noticeable police sirens wailing; nothing unusual except a bustling café uncharacteristically empty. I went to find les toilettes and then, seeing my phone lit up with missed calls and messages, learned that Notre-Dame was burning. The first time I saw Notre-Dame, I was overwhelmed. The enormous, high-vaulted Gothic nave, held in place by the miracle of gravity and mathematics and flying buttresses made me feel grand and small at the same time. Exactly, I remember thinking, what you should feel in a house of God. The next time I saw Notre-Dame, I stood numb and cold in the chilly Paris winter waiting to climb the tower stairs to explore the exterior, be eye-to-eye with the gargoyles, and marvel at the enormous bells. These days, my relationship with Notre-Dame, as with Paris, has evolved. These days, I explore the unusual. Lately, I’ve taken to wandering slowly around the Cathedral’s perimeter at all hours, searching until my neck hurts, for the legendary alchemist perched among the menacing gargoyles. I’ve never found him. Toward midnight, I walked down to the Seine and stood staring at the gaping hole behind the towers. Shock turned to sadness. 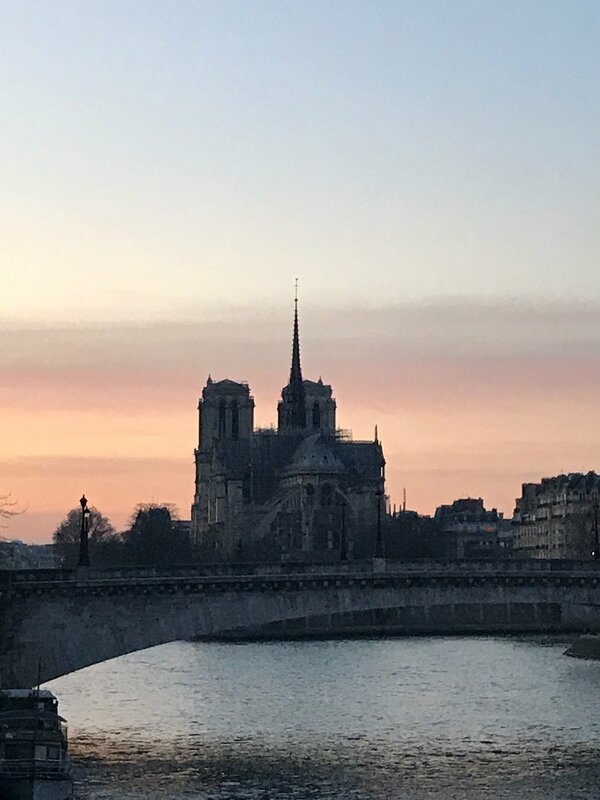 I stayed well past midnight thinking of Paris, and also of Victor Hugo and Viollet-le-Duc who, in the mid-nineteenth century, worked together to restore the Gothic masterpiece, adding the majestic spire. I saw enormous arcs of water spraying the flying buttresses on the eastern end and the crooked arm of a crane in the surreal gap behind the towers. A woman wearing red shoes stood on the quai, elbows resting on a shuttered bouquiniste stall, holding her head in her hands.